Chicago Blackhawks center Andrew Shaw is the kind of person that anyone would want in their close circle to back them up just in case things got awry. His numbers are definitely not going to score him a spot on the All-Star team but he is still a valuable player in the case that he just gets a lot of things done, the things that other players might not want to take on. In the 23 games he has played so far this season, his goals and assists count are not as high as his predecessors but they are not the worst on the team either. With five goals and assists, he ranks the highest in the PIM area along with Daniel Carcillo. Back in November, he was also demoted to the fourth line with Jeremy Morin and Peter Regin along side of him but instead of being bitter about it, he used it for motivation to start working his way back with the top six. Yes, he may currently be going through a slump but that will not last forever. With his previous work ethic experience from the OHL, that just makes him that much more determined to play better, tighten things up and just shoot the puck and score instead of mainly getting in players’ faces. Shaw started out with his junior hockey career playing for the OHL’s Niagara IceDogs back in 2008 and did nothing else but impress with his playing style that would later incorporate with the Blackhawks. He had a total of 17 points (eight goals and nine assists) in his OHL rookie season and already was ranked second on the team with 97 penalty minutes. He moved on to the Owen Sound Attack and the improvements were quickly shown. In a Sep. 15, 2010 game, he recorded a season-best with four assists in one sitting. From Oct. 14 to Oct. 23, he scored a point in six consecutive games and multiple other goals and points across the board. He earned the honor of OHL’s Hardest Working Player of the Year at the end of the season. 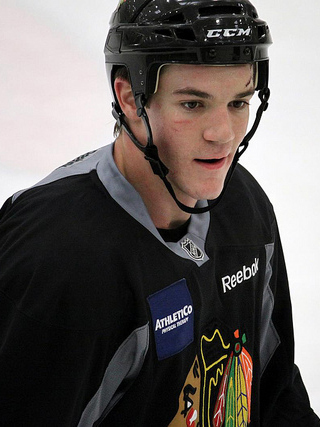 His professional season kicked off in 2011 with the Rockford IceHogs, the AHL associate of the Blackhawks, and split his time between there and Chicago. On Jan. 3, 2012, Shaw signed a three-year entry level contract and was immediately recalled to take place of injured fellow agitator, Carcillo. In his debut game against Philadelphia, he started his NHL career by getting into a fight with Zac Rinaldo. During the lockout, he went back to the IceHogs and served a six-game suspension for leaving the bench to join in on a fight. When the NHL season resumed, Shaw returned and played all 48 games that season which eventually led to the Blackhawks winning the Stanley Cup. He had the game-winning goal in a 4-3 overtime victory against the Boston Bruins and played with an injury that literally happened minutes before the big win. Andrew Shaw is no doubt a good asset to the Blackhawks. He is also only 23-years-old which still leaves room for improvements with his overall style and technique but never has been one to shy away from opportunities to get his team ahead. He is playing up with one of The Original Six teams which expects greatness and also with teammates older and wiser than he is in the game like Patrick Sharp and Jonathan Toews so maybe that will be the factor to have him step his game up during the rest of this season.